Bloomington, Ind. – Sycamore Land Trust recently purchased two properties totaling 115 acres near Beanblossom Creek in Monroe County, part of the Beanblossom Creek Bicentennial Conservation Area, one of only five such designated areas in the state. This acquisition adds valuable uplands to a critical area of wetlands and bottomland hardwood forest, which provide important habitat for wildlife and native plant species. With this purchase, Sycamore’s land holdings in the Beanblossom Creek Bicentennial Conservation Area have reached 1,345 acres, or over two square miles. The conservation area is home to fifteen threatened and endangered species including bobcats, Indiana bats, bald eagles, cerulean warblers, Kirtland’s snakes, and more. The new property is already being used by bobolinks and dicksissels, two grassland bird species that are unusual in the area. Expanding upon existing protected lands in this way provides further protection for vulnerable species, habitat for migratory songbirds, and ample growth opportunities for healthy wetland forests. Protection of riparian land also helps improve water quality and reduce soil erosion. The new acquisition is not yet open to the public at this time, to allow for staff and volunteers to plan necessary land stewardship projects. Specifically, these 115 acres add on to the Sam Shine Foundation Preserve, which is located near Beanblossom Bottoms Nature Preserve in northwestern Monroe County. Beanblossom Bottoms is Sycamore’s 600-acre public nature preserve that features a scenic 2.5-mile boardwalk trail with educational signs and fantastic birdwatching opportunities. 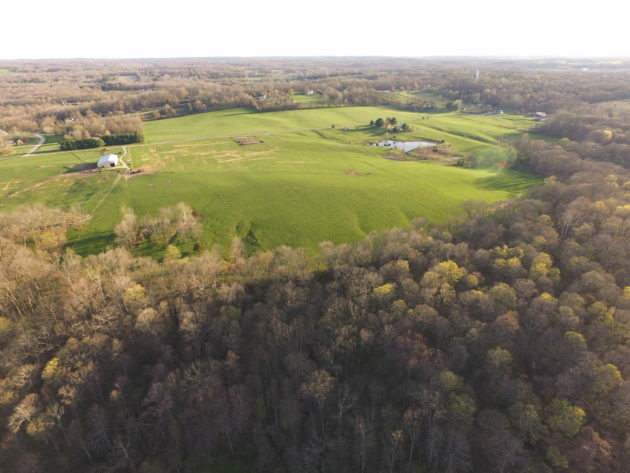 Sycamore works strategically to identify land with high conservation value, ideally located near or connected to areas we already protect through ownership or conservation easements. While the process of acquiring land is complicated, it results in success stories like this that help preserve open natural spaces forever. This land was purchased with funding from the Bicentennial Nature Trust, which is a project developed by former Indiana Governor Mitch Daniels and supported by Indiana taxpayers. In 2015, Sycamore Land Trust was granted $1million to purchase properties in the Beanblossom Creek Conservation Area, and part of the grant stipulations required Sycamore to match that funding by raising $1million in contributions from individuals and businesses. This project, and many others like it, are possible because of Sycamore members. More than 800 households and businesses across southern Indiana donate at least $40 a year to be Sycamore members, and beyond benefits like our gorgeous 24-page print newsletter The Twig and free admission to hikes and outdoors events, members feel the satisfaction of being a part of something lasting. Conservation takes a long-range vision and ongoing effort, but the results pay off. For example, Beanblossom Bottoms Nature Preserve was the site of the bobcat sighting by member Chip Methvin in April, and continues to inspire hikers every day. Sycamore Land Trust, 2019. All rights reserved.